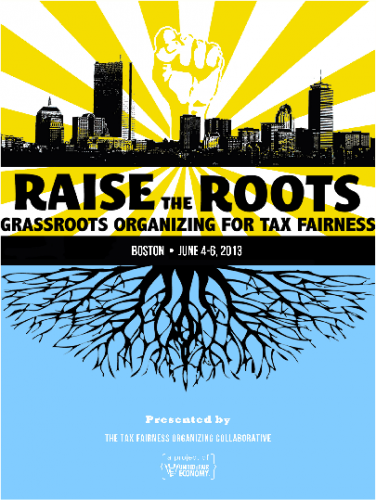 Raise the Roots keeps getting better, and 2013 was our biggest conference yet! Our partners gathered in Boston to learn different ways arts, culture and technology can shape and enhance their efforts to build grassroots power for sensible and necessary tax policy reforms in their states. Download this year's conference program. Raise the Roots keeps getting better, and 2013 was our biggest conference yet! Our partners in the Tax Fairness Organizing Collaborative gathered in Boston to learn different ways arts, culture and technology can shape and enhance their efforts to build grassroots political power for sensible and necessary tax policy reforms in their states. Participants were also connected with opportunities to collaborate across state lines to advance key federal policies. Looking ahead on the tax front, the House, Senate and President have all put forward budgets. All sides are doing their best to appear willing to compromise, but before a unified budget is passed, House Republicans, Senate Democrats and the Administration will all have to agree on the specifics. In other words, it’s unlikely that anything will happen soon. UFE is hosting our renowned Training of Trainers Institute this June in our own backyard in Boston, MA. We invite organizers, activists, educators, students, and others across the U.S. who want to join and advance the movement for greater equality.